Dark Clouds are Gathering. Can you Weather the Storm? Some pretty ugly weather rolled across the U.S. yesterday and overnight. We caught some of it where I live, though other parts of the country fared much worse. Bright flashes of lighting filled our living room, and great cracks and booms shook the house. You couldn’t see the rain in the pitch dark outside, but you could hear it beating against the siding and roof. The weather alerts were sounding from my phone every 5 minutes, sending my anxiety levels up a few notches each time, and my 6-year-old was squeezing the life out of my arm as we sat on the couch together. We live in a modern, sturdy house—something book characters don’t always have, particularly those living in a medieval or other historical-type era where the weather’s benevolence is crucial to survival. As I sat there in a comfortable well-lit room, with the lull of the T.V. to distract me from the tempest outside, I was reminded how weather can play a significant role in a story, or even become a character in itself. It can set the mood for a single scene, or shape the entire plot. Weather can grow crops, or destroy them, it can fill sails or sink ships, level homes, and flood streets. Its temperature extremes are sometimes deadly. Long periods of unchanging weather can affect the mental states of those subject to its effects. For those characters out on the road, the weather can give them an easy-going, pleasant journey or an uncomfortable, and even dangerous one. If a fictional society is largely agrarian, bad weather has the power to completely destroy it—no armies needed—by bringing about starvation and sickness. In a time before radar and weather apps, sudden changes in weather would no doubt have been mysterious and alarming to the average person. By the time they knew bad weather was coming, there wasn’t much time to prepare. Do you have a favorite book in which weather plays a significant role? If you’re a writer, how do you handle weather in your own stories? Is it something that just lurks in the background, rarely seen, or are your characters keenly aware of its impact on daily life? Have you ever written a story in which the weather actually took on the role of a character? Good authors like to get into their character’s heads when they’re writing, much like an actor does when portraying a character on the stage or screen. It’s the best way to make your characters seem real and behave spontaneously rather than assuming what they’d do next. But what happens when an author gets into the head of their villains? I’ve always had a bit of a warped imagination. You’d have to, to write about torture and other such horrors. When I started writing Shadow Stalker, I wanted a villain that wasn’t just evil. I wanted him to be completely psychotic, but not just for the sake of being psychotic. There had to be a purpose to it (which hasn’t come out in the story yet, so I won’t mention it here). I’m not a psychotic person, though. I’m sure I’d have been locked away by now if I was. So getting into his head and trying to think like he would has been rather difficult. Since the story is written from the main character’s POV, I didn’t have to write for him much, but he is the emperor of a society he built from the ground up. His mentality had to show in the “world” he created around him. So in that sense, I still had to get into his head. His psychosis is a mix of what he was born with and his experiences growing up or at least how he viewed his experiences as a deranged man. So I had to first do a bit of research to find out how a psychotic person might view the world. Then I had to put myself in his shoes. For a while, I could see the world as someone like that would see it, and it was a bit startling. It gave me nightmares. I have to say I was a bit tame when I started writing the story. The things that went through my head were much too horrific to share with my readers. At least to start with. I didn’t want to scare people away. If you’re a writer, at some point you’ve probably encountered it. The scary blank page. What makes it scary is that you have absolutely no idea how to fill it…and all the other blank pages that come after. Bits and pieces of ideas are swirling around in your head, and you’ve got disjointed notes scattered across different files on your computer. Your desk is full of barely legible scraps of paper you scribbled on in haste (gotta get that flash of an idea on paper before it dissipates), and notebooks you dragged with you on trips, or maybe to the park. Somehow it all has to come together into a cohesive story. But where to begin? I’ve been staring at that blank page for a few months now. Mostly because my overly-busy life hasn’t afforded me the time to center myself and organize my thoughts. I thought maybe if I just tried not to stress out about it, the ideas would start coming together on their own. You know, like when you forget someone’s name and the only way to remember it is to think of something else for a while? But you probably don’t have to be a writer to realize that plan was destined to fail. After all, I’m not trying to remember something forgotten, I’m trying to create something totally new. Its threads must tie neatly into everything that came before, as well as everything that is yet to come after. The further I get into my series, the more complex that job becomes. Sometimes it gets pretty intimidating and I wonder if I’m up to the challenge I’ve set before myself. So the blank page continues to stare at me, and the longer it looms, the scarier it seems. And that has been bothering me. A lot! So now I’m pushing myself to get past the anxiety and really focus on the task at hand. I’ve done it before, and I know I can do it again. But first I must stop thinking like a writer, and get into the minds of my readers. What are they expecting to happen next? Which of those expectations must be fulfilled, and which do I hold back until further on in the series? What surprising twists and turns will make the story fresh and exciting, rather than predictable? What will move and intrigue my readers to keep coming back for the next book, and the next after that? It is in answering those questions that I can more easily get back to the job of being a writer; balancing expectation with inspiration, and weaving together what seems to be nothing but a random tangle of loose threads into a vibrant, tightly woven fabric. I’m already starting to see the patterns and colors as they come together in the back of my mind. Scenes are taking shape, characters are whispering their thoughts to me as I sleep, and the mood of the book is building in my chest. That blank page doesn’t have any words on it yet, but all the signs are telling me the time is just about right to begin. Once again, I’ll do my best to fill it, and hundreds more, with words that will take my readers on new adventures, full of heart, wonder, and suspense. In the end, if I do my job well, my readers will inspire me to face another new set of blank pages. But that’s for another year—one challenge at a time. Did you make yourself some outlandish promises a few days ago about how many books you were going to read or how many words you were going to write in 2017? How are you coming along in meeting those goals. I honestly have done less than adequate due to being struck by sickness in the first week of the New Year. But, I promise you, I will not be stopped! I have completed a huge portion of Maharia, and I plan to have the rough draft completed by the end of the month. In the meantime, I am working with some very talented authors in prepping their releases from Crimson Edge Press. 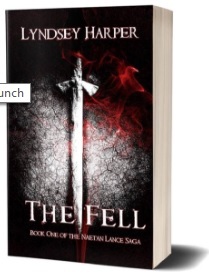 For starters, Lyndsey Harper will be releasing her dark fantasy novel, The Fell, on January 18, 2017. The eBook is available for pre-order RIGHT NOW. Make sure you have your calendars marked to join the Facebook Release Party. Take a gander at the blurb! Crimson Edge will also be introducing releases from Matthew W. Harrill and J.C. Boyd in coming weeks. But, I want to share you with another bit of important news. If you have not heard, we have opened submissions for our next annual anthology, The Fae & Fey. You can click on the image for the details! We look forward to reading your submissions. The new year is always such an exciting time for me. I love the possibility of a fresh start (actually I’m sort of addicted to fresh starts…long story) and that’s what New Year represents to me. It’s a chance to reflect on everything you’ve accomplished in the last year and start making plans for the new one. Every year I tend to feel as though I haven’t done much, but as soon as I start going through everything, I always realize I’ve done a lot more than I imagined. So, let’s reflect. What have I done in 2016 (because I know it wasn’t as much as I was hoping due to being sick for so long)? I finished Part 3 of my Shadow Stalker serial and started Part 4. I’ve begun the process of re-editing Part 1. I’ve started the foundational work on two new novel series, one of which will be written under a pen name. I also started a short story I was going to submit for entry in Crimson Edge’s anthology, but I didn’t finish it in time. Now, I’m reconsidering that story idea for another series. I also finished the edits on my Makari’s Mission novella that’s being published in a charity anthology being released this coming April. This coming year I will finish Part 4 of my Shadow Stalker serial. I also plan to write at least the first two novels in my A God’s Deception series and the first in my other series. And towards the end of the year, I’ll begin work on my new serial. I don’t have a name for that one, but it’s going to be about the origin of the shadow stalkers, so it will be pretty awesome! Oh, and I’m going to…yes, absolutely going to finish a short story for this year’s anthology that Crimson Edge will be putting out in 2018. So are you taking advantage of this opportunity for a new start? What do you plan to accomplish in 2017? I’d love for you to contact me and tell me all about it!